Nebraska returns its leading rusher from 2017, but one wouldn’t know that based on the conversation about the position over the last few months. Junior college transfer Greg Bell captured most of the headlines in the winter and spring since he committed to coach Scott Frost and running backs coach Ryan Held. He was one of the top junior college recruits in the country and wowed fans with his explosiveness in the spring game. Then 4-star recruit Maurice Washington beat the odds and was granted immediate eligibility by the NCAA after working through some academic issues. He arrived in Lincoln for fall camp and immediately began making noise. Like Bell, Washington is the kind of game-breaking back that puts up big numbers in Frost’s offense. Tre Bryant got some buzz before ultimately retiring from football, and many have wondered how local kid Jaylin Bradley fit into the picture. There wasn’t a whole lot of talk about senior Devine Ozigbo, though, despite the fact that he led the Huskers with 493 rushing yards last season. 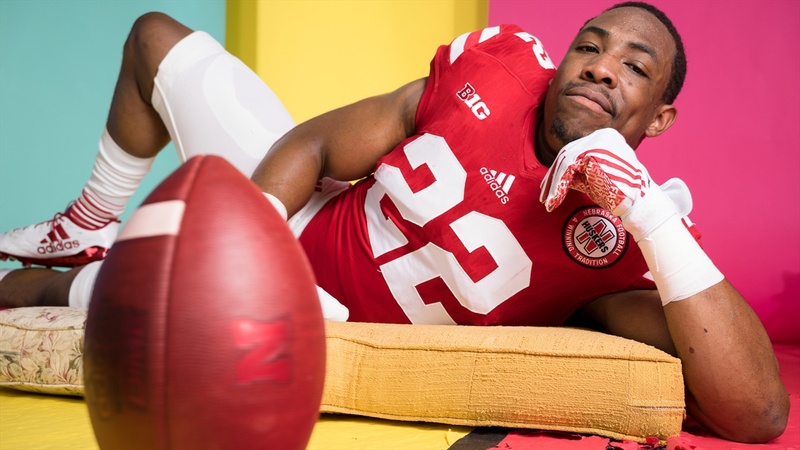 He’s sitting at 1,121 yards on the ground for his career at Nebraska. However, when Nebraska released its depth chart for Week 1 against Akron, there was Ozigbo’s name. The senior was listed as co-starter alongside Bell and ahead of Washington. A tweet from Ozigbo back in December proved to be prophetic. Ozigbo was more or less counted out last season too as he did not play in either of Nebraska’s first two games while Bryant tore it up until injuring his knee. Ozigbo only got two carries in Week 3, then proceeded to log double-digit carries in six of the next seven games. He only ran the ball three times in the last game of the season, however. Overall, despite leading the team in carries and yards, he only mustered 3.8 yards per carry. That wasn’t going to cut it in 2018, so Ozigbo got to work over the offseason and his new coaches took notice. In fact, Ozigbo’s made so much progress that Held mentioned him alongside the likes of Bell and Washington when asked about home-run hitters in the running back room. One of the men that will be blocking for Ozigbo come Saturday echoed Held’s words at Monday’s press conference. A reporter asked Nebraska’s other starting guard, senior Jerald Foster, about the newcomers in the backfield on Monday, but Ozigbo’s name was the first out of his mouth. Held has said he hopes to play three or four backs, and it seems clear that Ozigbo will be one of them.